Lip balm and Chapstick are two words often used interchangeably by people. Sometimes they refer to Chapstick as lip balm and lip balm as Chapstick. Are the two terms the same, or do they differ in some way? Let us start by defining the two concepts. 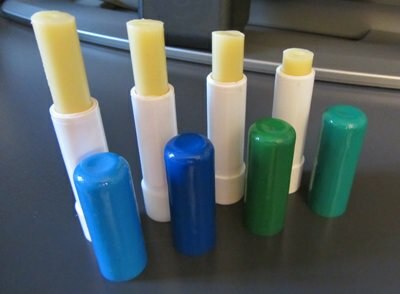 Lip balms in lipstick-style tubes of different sizes. Lip balm is a wax-like substance for the lips that is used to moisturize, soothe and relieve cracked or dry lips. It can also be used to medicate lip problems such as cold sores. It commonly contains beeswax or carnauba wax, and other varieties of lip balms have other similar ingredients like camphor, paraffin and petrolatum. These ingredients create a protective, occlusive layer over the skin that prevents loss of moisture. They lock in the moisture and insulate lips from external exposure such as the drying effects of wind and cold weather. Other ingredients consist of flavor, fragrance and dye. Nowadays, lip balms include SPF to provide added protection from the sun, since lips are exposed to sun damage. Lips are quite sensitive because of their thin skin, so using a lip balm is helpful. Lip balms are contained in different forms such as jars, tiny round tubs, cylinders or twist-up tubes like lipstick. It can be applied using the fingers or directly if it is in a lipstick-style tube. Lip balm was originally clear, but these days tinted lip balms are popular with young women because they give more color to your lips and can be used as lipstick. Chapstick is one of the many brand names of lip balm. As the name indicates, Chapstick prevents chapped lips and comes in a lipstick-style tube. It is manufactured by Pfizer Consumer Healthcare and is among the most popular brands of lip balm. In fact, its popularity has made Chapstick a generic trademark even though the term is still a registered trademark. There is actually no difference between a lip balm and Chapstick. Chapstick is a brand name for lip balm. It is widely known so most people use the term Chapstick instead, but there are other brand names for lip balm such as Blistex. A lip balm is a lip salve or a medicated ointment that is applied to moisturize chapped or dry lips and relieve other lip problems. So all Chapstick is lip balm, but not all lip balm is Chapstick. If your lip balm’s brand name is not Chapstick, don’t use the word Chapstick. You can call it by its brand name or simply a lip balm.